To read about safety tips for baking polymer clay, please refer to my Safety page. To bake your polymer clay creations, you will need an oven that can be accurately programmed to generate temperatures between 215°F (102°C) to 325°F (163°C). This range covers the baking temperatures for all existing brands of polymer clay. 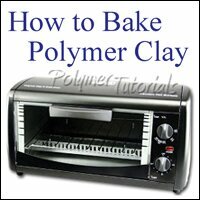 You can use a regular oven, a toaster, a convection oven, or a special oven for polymer clay (available in most craft stores in the polymer clay section). Do not use a microwave oven to cure polymer clay. It is acceptable to use a regular kitchen oven if you are not baking polymer clay too often or if you have a tall item to bake (a vase, for example). However, if you are planning to work with polymer clay a lot, consider buying a separate oven. The slight odor released during baking polymer clay may be adsorbed by the walls of your oven. As a result, you may notice the polymer clay smell the next time you use the oven for baking food. That is why it is better to have a dedicated polymer clay oven. Please refer to my Safety page for more information. Please refer to the Additional Tips and Tricks section at the end of this page for more information about controlling the polymer clay odor during baking. As I said before, ideally, the oven for polymer clay has to be accurate. This means that when you set it up to a certain temperature, the oven shall produce this particular temperature. In reality, however, most ovens are slightly off. For example, my oven under-heats, so in order to have 300°F in it, I have to set it up to 315°F. That is why, before using your oven to bake a polymer clay object for the first time, you have to check its actual temperature against the set temperature (and plan to adjust it accordingly, if necessary). Do not trust the built-in thermometer. Use a separate one, such as a special thermometer for polymer clay baking (available in craft stores in polymer clay sections and online). You may also use a candy thermometer or a stand-alone oven thermometer. Also, keep in mind that different sections of the oven usually reach slightly different temperatures during baking. The middle section is usually the best place. Spots close to the heating elements get hotter, while those close to the front door are usually colder. Plan to use the middle part of the oven for baking your polymer clay items, and place your stand-alone thermometer in this part of your oven as well. To properly check the oven temperature, first wait until the oven indicates that it has reached the set temperature. If your oven does not have this feature, wait for about 20 to 30 minutes from the time it is on. At this point, you may read your stand-alone thermometer and compare it to the oven setting. Leave the thermometer in the oven and read it a few more times over the next 30 minutes to check for any temperature spikes. If the fluctuation range is too wide (more than a few degrees), you need to find another oven. If the oven holds temperature well, but the actual temperature differs from the set value, adjust the set temperature as needed. To be thorough, repeat the procedure above at the new setting. Once you find the corrected setting, write it down and use it every time when you set up your oven. Re-check once a year or if you notice any changes in the oven's performance.